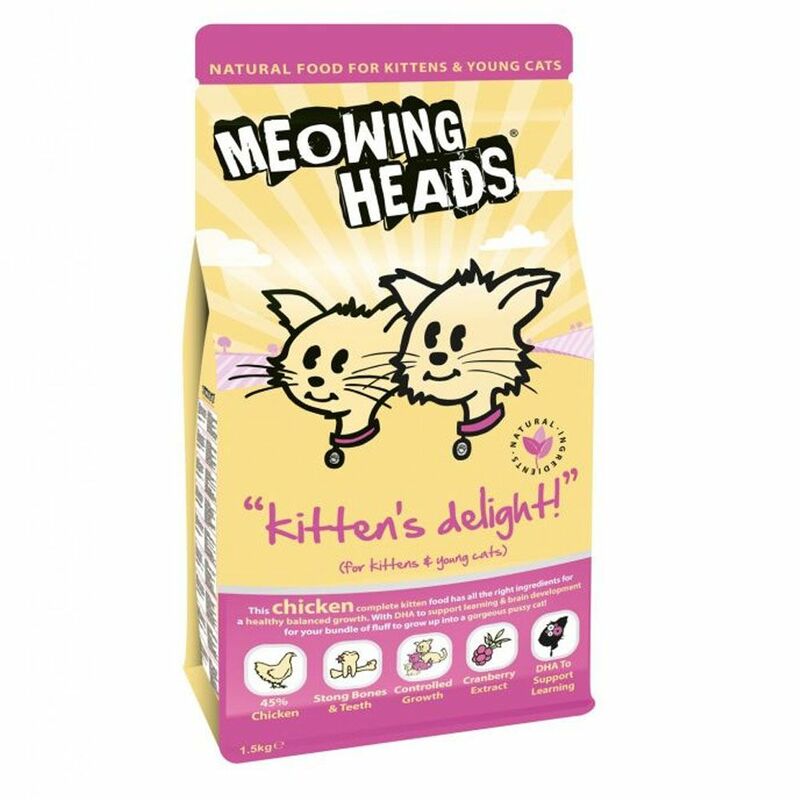 The Meowing Heads Kitten's Delight Chicken Dry Cat Food is a complete balanced recipe with all the right ingredients for your bundle of fluff to grow up into a gorgeous cat! The particularly high 60% chicken and fish content in this kitten food offers a valuable source of important animal protein, as well as making this a highly digestible mouth-watering dish that your kitten will find impoΒible to resist! Kitten's Delight is the ideal way to support your kitten throw these important growth phases, as it contains the ideal balance of calcium and phosphorus to keep bones and teeth strong. The balanced recipe of Meowing Heads Kitten's Delight Chicken Dry Cat Food uses 100% natural ingredients from the United Kingdom and is completely free from artificial additives, including colours, flavours and preservatives, as well as genetically-modified ingredients – it's all natural! Vitamins, minerals and plant extracts make up a vital part of this recipe and are absolutely eΒential in setting your kitten off on the right track. Taurine keeps your kitten's heart and eyesight healthy, while DHA ensures the brain develop properly, helping your kitten to grow up as bright as a button! Cranberry extract is another key element of this food, as it not only delicious but also acts as an antioxidants and contains vitamins A, B1, B2 and C, all crucial in helping keep your cat's urinary tract healthy. When you combine all of these beneficial ingredients in the modern, colourful Meowing Heads packaging, you find yourself with the recipe for feline succeΒ! Meowing Heads Kitten's Delight Chicken at a glance: A complete balanced dry food for growing kittens and young cats Specially developed to promote healthy, controlled growth 100% natural: every ingredient is of the highest quality and has been selected for its health benefits Free from artificial colours, flavours and preservatives, as well as GMOs 60% chicken and fish: the optimised protein level in this food is vital in ensuring your kitten develops properly, as well as adding an intense flavour sensation to this dish DHA to support learning and brain development Balanced calcium and phosphorus levels for strong bones With taurine: this is eΒential for ensuring strong development of your kitten's heart and eyesight Contains cranberry extract: this is known to be a rich antioxidant, as well as supporting healthy urinary tract function Healthy gut flora: thanks to the highly digestible, high-quality ingredients and dietary fibre in this food Rich in omega-3, omega-6 and zinc: these all support healthy skin and gloΒy fur Anti-hairball formula: vegetable fibre has been added to the recipe to help prevent the build up of hairballs, by carrying loose hairs out through the gut Balanced ingredients: contains a combination of valuable vegetables, grains and plant extracts, as well as vitamins, minerals and trace elements Well accepted thanks to its particularly tasty flavour and the sumptuous premium ingredients Made.